Crap, my thrifted wallet has a broken zipper, and my coins keep spilling out into the bottom of my purse. I wonder if it’s fixable? Sure, I probably spent only $4 or so on it in the first place, but I’d rather fix something and keep it out of the landfill. Then again, the card slots have been getting increasingly stretched out to the point where I have to stuff dead gift cards behind the regular cards to keep them from falling out. Damn, I think I actually need to replace the wallet. I wonder if anyone has one lying around that they’d just give to me? I should post on my local Buy Nothing Facebook group. Hmm . . . nobody replied to my listing. I guess I need to admit defeat and just buy a used wallet. I like to buy used, but I also like to save my dollars. (After all, less money spent on a wallet means more actual money in the wallet.) I’ve spent all my Goodwill gift cards, but I do have around $10 left on a William Temple House thrift shop gift certificate. I should go there. Then again, The William Temple House is way across town. I should wait to run this errand until I’m already in the area. I’ll be dropping my son downtown for his last college final. That’s not too far from The William Temple House. I should go and see if they have any wallets that I like. Here I am at The William Temple House, I wonder where the wallets are? Oh, here they are. There’s only one in the large style that I like. It’s an Ann Taylor and it looks brand new and is priced at $5. I could swing that. However . . . it’s black patent leather with a zebra-printed cowhide flap. That’s unbelievably tacky. However . . . maybe I can pull it off as ironic tacky, sort of an homage to all that is tacky. Yes, I can definitely pull it off. Move over, Carmela Soprano! This is a totally normally shopping process. Right? Imagine the boring wallet I’d have ended up with had I gone the traditional American route and shopped at the mall. A newly manufactured wallet shipped from across the world, having been manufactured in a far flung and likely sketchy factory. No thank you! I’ll take tacky over sketchy any day of the week. Went garage saling this morning, spent $10.00, scored an armload of toddler clothes for my granddaughter and a friend’s granddaughter, plus a couple of things to add to my ThredUP bag, 2 books (1 to read & then trade, 1 for a gift bag I’m putting together), 3 stuffed animals (1 for GD, 2 for OCC), 3 necklaces (2 to repurpose and sell, 1 for my friend’s GD), a towel rack that I’ll repurpose into a bracelet holder, a box of notecards, and a pair of like-new volleyball kneepads. I also sold two of the books I recently listed on Half.com. And the friend I repaired some family heirlooms for is coming over to pick them up and take me out to lunch (and also pay me $21 for the work.) Score! Betty Ann, how have you found your experience at Thred Up? I have a bunch of nice name brand clothes I was thinking to send there but wasn’t sure how well they paid! I have used ThredUp several times in the last year (selling extremely nice clothing from my pre-baby lifestyle). I find that they pay “just okay”. Even stylish, desirable, very high quality, and practically new items don’t bring that much up front or they are put on consignment and you split the return with the company (but the sales they offer to buyers and the desire to move things through mean that you rarely make that much off really high end stuff). I have used them mainly because my life has been so busy with a new baby and I am too tired to list on eBay or run around town. If you feel you have the time to list items on eBay or a local high end consignment shop then I would suggest to go that route. In my experience, Thred Up is good if you are just trying to get rid of stuff quickly and money return isn’t the main goal. This is nearly exactly the process I went through when the zipper on my wallet broke. I validate you. My sister had given me the wallet and I had used it for well over 5 years. I continued to use the wallet, sans change compartment, while I checked Salvation Army (twice), ebay (shipping! ), and Target (not paying that much for a crappy looking wallet). Finally found a brand new Liz Claiborne wallet at a garage sale for $1. P.S. Tasteless me likes your new wallet. The cowhide looks soft. Ann Taylor brand new for $5 is a great score–and for that, I could live with imitation zebra myself. True confessions time in regard to wallets: My own requirements are as specialized as (though slightly different from) yours–so when I find one at the right source for the right price, I scoop it up and put it in my “Let’s go shopping in the attic” footlocker. I’ve got two stockpiled. Love the wallet. I purposely got an unusual wallet so in those many many moments where I can’t find my wallet it sticks out. The bright colors have kept me from leaving it places, too. Enjoying a quiet afternoon at the mall. Yes, frugality at the mall. I have 2 free hours of kid care at the drop and shop daycare, so I put the kiddos in to play with some “new” toys and I am enjoying the mall’s free AC, WiFi and comfy chairs as I relax inside on this super hot day! If you find yourself unable to become one with the zebra you could always try a black permanent market? Heck, embrace it to the fullest and color it in hot pink. But whatever you do, I think you might need to name it. Too much moxie to not have a name. I’ve bonded with it, worry not. Yeah, my kiddo is rocking a pair of odd looking swim trunks. For 25 cents at a garage sale I had to overlook the odd orange/ flesh color. He thinks they’re great! If I know that the replacement is going to be used, I try to start looking before the one I’m using is completely shot. My new-to-me wallet was ninety-nine cents at Value Village – and it’s a style I would have picked out on purpose. I went to Grocery Outlet for the very first time today. It is only about a mile from my house and I have driven past it many times, but I didn’t want to shop at any more grocery stores since I already visit Trader Joe’s, Winco and Fred Meyer’s regularly. Still, I keep reading here about the great bargains at Grocery Outlet, so I finally decided to give it a try. It was great. I bought mostly cleaning supplies like laundry and dish detergent as well as baking soda and vinegar (which I use for cleaning). The prices were even better than Winco. I guess I have to add a new grocery store to my list. 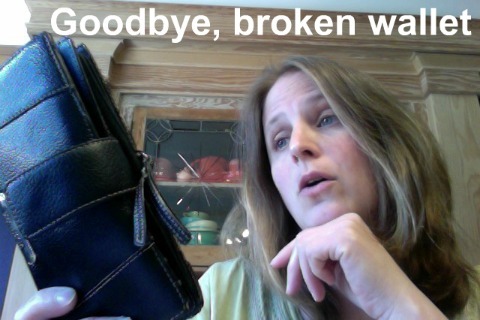 I’m glad you have bonded with your wallet, Katy, because it looks like one which will last for a good many years. The wallet I am now using is one which was given to me as a gift about 7 or 8 years ago. at the time, I didn’t need a wallet, so I put it away in a closet and yes, forgot about it. Conveniently, a few months ago, I cleaned out various closets and found it – exactly at the time I really needed a new wallet. I guess I need to come up with a system for reminding myself of things I am saving – or maybe just clean my closets more often. My younger son needed a new wallet exactly when my older son decluttered his room and found a perfectly good but unwanted wallet. Kismet! I usually have a gifted wallet or two on hand. In the past couple years, however, I have grown to like Vera Bradley purses—-oh, not at full price, of course. My very first was obtained at an outlet store in Mississippi when we were on vacation a couple years ago. It was $70 at the outlet price, but they had a % off sale, and it was just a week past my birthday so they gave me a birthday discount, and it ended up costing me $17.50. Then that was getting a little grungy looking after 18 months or so, and I took it out of service until I can wash it and mend it in one little spot, so I got another one. I honestly don’t remember what I paid for this one, but it was possibly in the neighborhood of maybe $30, and I totally love it and because its lime green and royal purple print, it goes with my whole wardrobe, just about. So last Christmas I kept getting these ads from Vera online, and finally I looked at a too good to be true deal: I knew one sister wanted one, and I thought–I’ll get them each one. With the deal, I paid about $30 for each of theirs and got my next one, ABSOLUTELY FREE. It’s still in a bag in a drawer because I have not needed it yet. But now I have three bags and I can swap them in and out of service when I feel like it, of when they get dirty, and I’m set for a while. I like them much better than the leather bags I used to insist on–much lighter weight hanging off my arthritic shoulders!! AND—here’s the connection—-they have so many pockets I don’t even need a wallet with them. I have a small, OLD change purse to collect my coins, but credit cards, ID, and cash go in pockets of their own so I know where they are at all times. I love it. 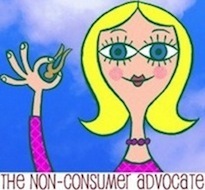 I would prefer to think of it as “brilliantly visible in my black hole of a purse” rather than tacky! Love the wallet. Use it and love it. Love your attitude. Keep at it ?Katy. You inspire me everyday! Last night I was thinking about being frugal means you need to anticipate needs in advance. What made me think of this was in April I helped with the church clothing and household giveaway. It has been going on twice a year for 25 years and I have helped for the past 8-9 years. A group of about 25 women sort through and organize all the donations on Friday night and then it is open to the public on Saturday morning and is a free giveaway. All who work on Friday can “shop” for anything that they might need. As I was looking I came across a heating pad which needed its flannel cover replaced. I got it because I knew my heating pad at home was over 30 years old and I wasn’t sure how much life it had to live. Between all the painting and cherry picking this week my back was killing me and so the other night I pulled out my old heating pad and it never got hot. It was so nice to be able to get out the “new” one and not have to make a run to get one at Target. Once again anticipating needs saved the day and my budget! Oh course I don’t mean this in a hoarding or fearful accumulation way but in a way that is being mindful of the true lifespan of household items. Good point about thoughtful acquisition vs. “hoarding or fearful accumulation,” Kim. That’s a line I walk often. Oh, and I’m probably one of the 17 people in the country who actually dislike going to Target. The smell of off-gassing from all the plastic just makes me so….verklempt!! I did not like Target eighter… so a lot of other Canadians too I guess, since they went out of business in my country! I like to carry a change purse with card slots on the inside. Those never seem to turn up at a thrift store because the catch eventually wears out and they’re useless at that point. My thrifty save of the week was putting a pair of perfectly good Behringer headphones back into commission by sewing fabric covers for the flaking pleather on the ear pads and the lining of the head strap. I was avoiding using them because I’d wind up peppered with flakes of deteriorating plastic. Now they’re awesome and useful again. well done!! I live in a very rural area, and I am not very optimistic about buying thrifted things, even in the nearby city – I just don’t seem to find anything worth buying. I don’t shop often enough to really know. I really love the idea of Portland – even though property values are very high by midwestern standards, there seems to be ample opportunity to buy used goods. I wish the midwest were as progressive as the northwest. This post is exactly why yours is the ONLY blog I’ve not deleted from my inbox. It’s funny, yet thought provoking. I put you right up there with Erma Bombeck. Thanks for all your insight. It helps keep me on the straight and narrow. Another delightful post. I have had the same wallet for many years. I have in reserve a Coach leather wallet (with matching purse) that is a double hand-me-down. My sister gave it to my mom and then my mom gave it to me. I would never buy Coach new, but for free I took it. My wallet is all patched up with duct tape and when I take it out at the store sometimes the cashiers comment that I need a new one. It is a small flat silk one from a Chinese import store and I can’t find another. I have three other wallets around the house that belonged to my late husband. I sometimes think I will use one of those. I prefer a small wallet without the snap thing on top. Haha I love your wallet and your story to go with it. thrifty living is a fun way to live. Many people have been led to believe that it’s not fun at all, but they are definitely mistaken. So fun, so very fun! Bwah ha ha ha! I’ve got a wallet situation similar to yours. It’s been ongoing for several years now. Zipper pocket on outside for change gave out a long time ago. I keep using it, sticking my change in my pockets or stuffed into the inside of my wallet which I then make sure I carry upright at all times… However, I do have one in my closet that my sister, who is far flashier than I, gave me for Christmas a couple of years ago. It’s shiny, gold, alligator print. If you lived in the South, you would receive so many compliments on that wallet. It would be “high fashion” here! And I would accept each and every one of those compliments! For some reason, I’ve never been able to abide animal prints. I think before I bought that wallet, I would have stuffed my money and cards into a bandana and made do with that! However, that was a good bargain, Katy, and I’m sure you’ll grow to love your wallet as an old, eccentric-looking friend. My wallet is at least 15 years old — my kids got it for me at Wilson’s leather as a Christmas gift when my husband bought a leather jacket for me from there. I also got the free checkbook cover. I still have and use all three items– I’ll give them credit for hanging in there. Hey now! 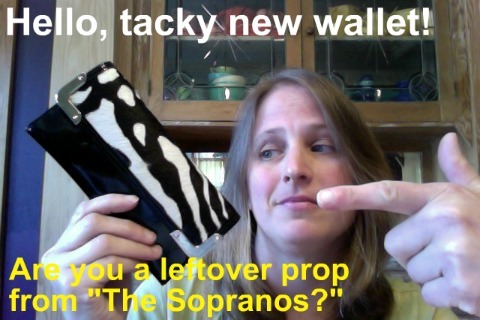 I have that wallet! j/k, j/k. I do love it however (in a ” hey look at this awfully tacky wonderfully used $5 wallet holding my Benjamins” kind of way. I kind of went through the same process with my sunglasses. They are so scratched up at this point (after 10 years! woot!) that I can barely see out of them and I’m pretty sure are a hazard to wear when driving. So I went scouring the thrift shops for new ones that didn’t hurt my nose or ears or make me look like Zsa Zsa Gabor. I couldn’t find anything, came home defeated and my husband nonchalantly tells me he has a pair of like new Ray Bans in his car! What?!??! I stole those suckers so fast and now I’m the coolest mom in town (literally).